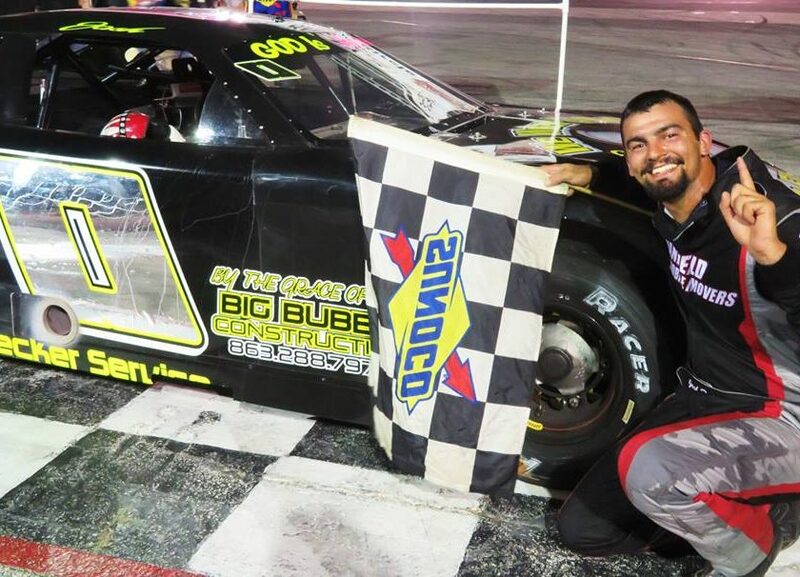 After two weeks away from stock car racing action due to the Night of Destruction and the time needed to clean up after it, Auburndale Speedway gets it’s season into high gear starting this Saturday night. 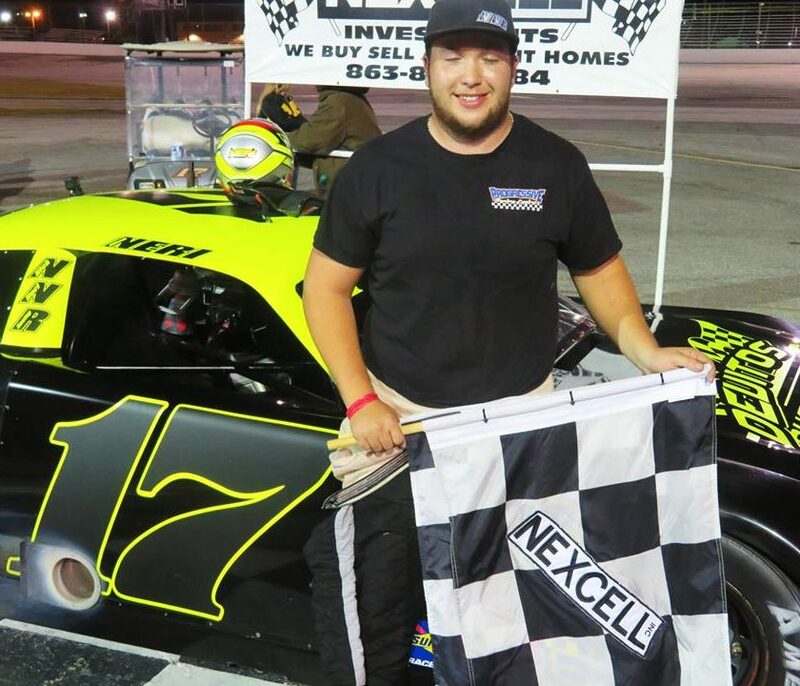 The Sunshine State Challenge Series has a pair of 50-lap contests on tap for the Open Wheel Modifieds and the Street Stocks plus the Mini Stocks and Scramblers will also see action. Along with the racing, there will be a huge “Easter Bash.” This big Easter egg and prize hunt will take place at intermission when track officials and a bevy of volunteers lay out the prizes and eggs on the track and in the infield. Once the goodies are set out, the younger kids aged 7 and under will go with their parents to one area to do their hunt. They will be given a set time to collect all they can and then the kids aged 8-12 will be given a set time to go through all that remains on the track. The children will be asked to be on their best behavior, though, as the speedway will not allow any running, pushing etc. If any child becomes unruly, track officials will ask them to stop collecting and go back to stands with their parents as the speedway wants everyone to have a good, yet safe, fun time. After the “hunting” concludes, track workers will clean up everything that remains quickly so racing can be resumed in a timely manner. 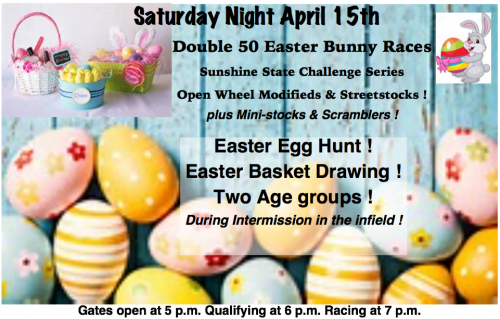 Along with all the fun at intermission, kids, as they come in, will receive a ticket for a special drawing for Easter baskets donated by the drivers, race teams and even race fans of Auburndale Speedway. Again, for the drawing as well, the kids will be divided into two age groups (7 and under – 8 to 12). The total number of baskets that end up being given away will be divided among the two age groups based on how many there are in each group. Tickets will be drawn throughout the evening so every child has a fair shot at winning. Along with the Easter baskets, two bicycles will be given away thanks to the generosity of Mr. Eric Shane. As far as the on-track racing activity goes, a good field of cars is expected for both SSCS races. L. B. Skaggs of North Ft. Myers, winner of the SSCS OWM race here on February 4th, currently leads the point standings by 13 over Naples driver “Steady” Eric Rudd. Rudd is just three markers up on third place Roger Blevins of Bartow. Ft. Myers hot shoe Doug Moff and Bushnell’s Todd Brown round out the current top five in points. Other Modified standouts expected include Devin McLeod, Greg Krom, Richie Smith, Shawn Harper, Bobby Blake, Cody Pitts, Bobby Mobley, Leroy Moore and the “Polk City Flash,” Josh Todd, who hopes to debut a brand new #0 machine. The Street Stocks have been a pleasant surprise with the SSCS this year with great fields of cars and red-hot competition. Danny Caylor of Lehigh currently heads the point chase by 14 over Kenny Gibson of Venice. Gibson and Caylor finished 1-2 in the race held at Auburndale on February 4th. Gibson is just one point ahead of Punta Gorda veteran Ander Jackson while Bradenton’s James Nanney and Donnie Powers of Myakka City are tied for fourth. Those five will be challenged by a host of other speedy competitors including local favorites “Terrible” Ted Head, Ross Francisco, Steven O’Steen, Josh Lindsey, Brandon Duchscherer and James Wright III. Other possible entries include Joey Bifaro, Travis Barfield, Dennis Wilson and Garrett Thompson. Chris Narramore, Sr. remains unbeaten in the Mini Stock class but the rest of the field has been gaining on the veteran machine shop owner. Young Colt Cecil is showing much promise (and lots of speed) as of late as have veteran Tony Davidson (when he can avoid the mechanical gremlins), Bruce Cozad, John Cummins, Jr. and several others. Danny Leet has gotten his car back together after a hard crash last time out. The Scrambler features have been toss-ups so far this year as several drivers have visited victory lane including Dustin Wilson, Glen Swanson and Keith Cantrill while Anthony Carroll, Andy Travis and Shane Bennett have been knocking at the door. 4:30-5:30 pm. 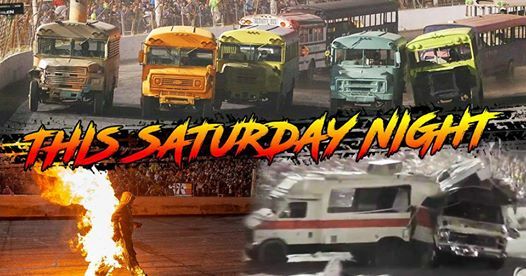 Grandstand gates open at 5 pm with Street Stock and Modified qualifying at 6 pm. Racing begins at 7 pm with 8-lap heat races for the Mini Stocks and Scramblers. Feature racing follows with 20 laps for the Scramblers followed by the 50-lap run for the Street Stocks. Intermission follows with the big “Easter Bash” for the kids. After that concludes, the Open Wheel Modifieds hit the track for 50 laps before the evening of racing concludes with a 25-lap run for the Mini Stocks. Adult admission is just $15 with seniors 55+ $13. Children ages 5-12 are just $5 and all kids 4 and under get in free. The family 4-pack is just $32 for two adult and two children’s admissions (a $40 value). Pit passes are $30 per person and all parking is free. A reminder that this Easter Sunday at Auburndale Speedway there will be a Car, Bike and Sound Show from 3:30-9 pm. This will be a fantastic way to celebrate your Easter afternoon and evening. Tickets for this event are $10 general admission and $5 for kids 5-12 while all kids 4 and under are free. There is a $40 car show entry that includes track parking. For more information go to www.auburndalespeedwaycarshow.com.